Artist’s impression of The Haven Lakeside Residences in Tambun, Perak. It takes a foreigner to help us appreciate what is available in our backyard. It also takes the can-do spirit of Australian Peter Chan to do the unthinkable. 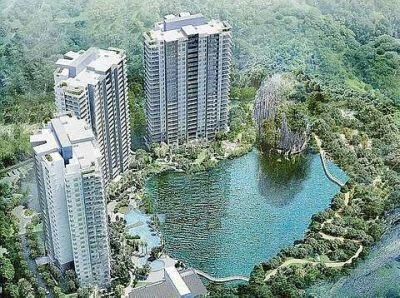 The limestone rocks and hills around Ipoh have so enchanted the co-principal of Superboom Projects Sdn Bhd that he is building three blocks of luxurious condominiums The Haven Lakeside Residences in Tambun, 15 minutes' drive out of Ipoh. The area that Chan has set his sight on forms part of the Malaysian Main Range, which stretches from southern Thailand to Johor. Limestones have today become synonymous with Ipoh, just as the Melawati Range is synonymous with Taman Melawati, Kuala Lumpur which also is part of the Main Range. Leveraging on the green factor and old money looking for new lifestyles, Chan will be building what will be Ipoh's most luxurious condominium priced from RM330,000 to RM2mil a unit. It will also be the tallest building in and around Ipoh. The tallest building is Tower Regency, a 20-storey hotel in Ipoh. The project is expected to set a new benchmark for the Perak property market. “Property prices move up quite a bit in the Klang Valley and Penang but there is this perception that it should be low here (Ipoh). It is just that there is little population growth here. The young people keep leaving home to seek work in Kuala Lumpur and Penang. So, when there is no population growth, there is no demand. But environmentally, Ipoh is an ideal place to retire in. The cost of living is not as high as in Kuala Lumpur or Penang,” he says, adding that there are several hospitals and a supermarket chain within a short drive of the project. For years, developers in Perak have concentrated on building double-storey terraced and semi-detached houses. Because of the abundance of land, the idea of building luxurious high-rise condominiums did not figure. Chan looks at the market demand with new lenses. There are many empty nesters in and around Ipoh, with a population of about 800,000. Increasingly, security has become an issue. There is no room today for a five- or six-room house, unless two or more generations stay together, he says. His target audience is the retirees' market in and around Ipoh, Kuala Lumpur and Singapore. The other market segments are those in search of a holiday home. “Ipoh is a quiet and serene place to retire and to holiday in. Penang and Malacca are oversold but little is known about Ipoh. I would like to change that,” he says. He is offering 11 layouts with built-ups ranging from 1,000-3,000 sq ft. Although there are about 500 condominium units, Chan is offering about 300 covered car parks in a three-storey parking podium with lifts. There will be two separate covered parking facilities with additional bays on ground level. Chan does not expect full occupancy all year around. Hence, he is working with Best Western Hotels group, one of the world's largest hotel chain to manage, market and lease out some of the properties. Maintenance charges for the first 1,000 sq ft is 22 sen, the second and third 1,000 sq ft at 16 sen and 12 sen per sq ft.
On the issue of the terrain housing the three 26-storey blocks, Chan said the site has been tested by three independent engineering companies working on structure and foundation. Prof Bernard Pierson, the Shell chair for Geosciences at Universiti Teknologi Petronas was reported to have vouched for the safety of the residences. This will be Chan's third project. His previous two projects are double-storey terraced housing at Subang Galaxy in Subang 2, Selangor and Permai Lake View Apartments, located adjacent to the 14-acre Haven site. Chan completed the apartments in 2006. Fronting the Permai Lake View apartments later on will be about 30 shops. The concept to build the condominiums came in 2008. The three blocks will be sited around a 4-acre lake on the foothills of the Main Range, where a 14-storey limestone rock stands. Chan's 14-acre site, inclusive of the lake, is adjacent to Sunway's plot of land which includes a hill. On the other side of the hill is Perak's famed spa resort, The Banjaran. “Things are moving in Perak. It is just that this place has long been overlooked, with Penang and Malacca oversold as a retiree's home and a retreat,” he says. The project, with a gross development value of RM250mil, is being constructed by Bina Puri Holdings Bhd and Beijing Construction Engineering (M) Sdn Bhd, two top contractors in Malaysia and China respectively. The leasehold project is expected to be completed in 2013. We are in very interesting times when changes are happening in almost every sphere of our lives and in every part of the world. We are certainly experiencing first hand the age old saying that “the only constant thing is change”. With change comes challenges and opportunities. To avoid being left behind, all alike from the common folks to governments and organisations should be proactive and take the necessary steps to be part of the big wheel of change. One of the big changes underway for the country is the need to take the big step forward to become a high income nation. This is indeed a welcoming change that will allow all working Malaysians to progress up the income ladder and to look forward to bigger pay checks and maintain a higher standard and quality of living. Widening the pool of high income earners is certainly good for the country to take a leapfrog forward across all the economic sectors. This is because it will promote higher domestic consumption and more sustainable growth for the country. In the real estate sector, one of the keys to ensure sustainability in the local market is to increase the people's per capita income at least to the level of the other developed countries in Asia. Unless we grow our per capita income, we will not be able to move up the value chain and see a phenomenal growth in our real estate sector. The vast difference in per capita income compared with the high income countries of Singapore, Hong Kong, South Korea and Taiwan could be the reason for the big property price gap here compared with that in those countries. Likewise in the other sectors, there are also many growth opportunities to be tapped by moving up the value chain. It does not help that the country is still dependent on so many foreign workers which is causing substantial outflow of foreign exchange to the other countries. Instead of relying on these supposedly lower wage foreign labour, it is time to revert back to our own Malaysian workforce which will have substantial spillover benefits to the local economy. Although the pay structure will have to be revamped upwards, employing our own workers will ensure that they will be duly employed and prevent them from getting involved in other undesirable activities if they remain unemployed. Like many high-income countries such as Singapore, Hong Kong and Taiwan, foreigners should only be allowed to work as domestic maids and high skilled and critical professional jobs that are in short supply locally. This way, the people's wages will have a chance to move upwards and not kept artificially low like what is happening now. There will also be less outflow of funds from the country. In the real estate sector, one of the most obvious changes is the rapid appreciation of property valuation and the sudden windfall for many property investors. The sharp rise in property prices in some parts of the country has caused both anxiety and excitement depending on which side of the scale one is at. Developers certainly have a big role to play in the way property prices move. The pace and size of their project launches will determine the supply coming into the market. When there is still a strong pent-up demand for more affordably to higher priced houses like what is happening now, it will help if developers speed up on their launches and help to ease the supply flow. The price of a property when it was first launched is an important factor, but beyond that, the rate of how much a property will appreciate or depreciate is dependent on a number of factors including demand and supply. While location is a major factor that determines a property's value, other important considerations include infastructure network, accessibility, security, and the amenities and facilities provided. I have observed that while there are townships and neighbourhoods that continue to be relevant and look refreshing and happening, there are also many that are dreary without much going for them. Of course, the value of properties will also differ accordingly. Developers should continue to establish strong rapport with their buyers even after the projects are handed over to buyers. We should give the thumbs up to developers who consider the handing over of completed projects as the beginning of their relationship with their customers. They continue to listen to their buyers, help to form active and engaging community activities and add value to the townships they build. It is important not to undermine good after-sales service as they can work wonders for a developer's reputation and promote loyalty and repeat purchase from customers. Deputy news editor Angie Ng hopes to see developers sprucing up parks in their townships instead of cannibalising them and deprive residents of a healthy form of recreation. BEST Western International Inc, one of the world’s largest hotel chains, has been appointed by property developer Superboom Projects Sdn Bhd to manage, market and lease out The Haven Lakeside Residences. 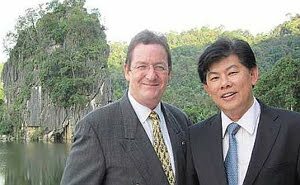 Jonathan Badman (left) and The Haven Sdn Bhd co-principal David Yam at the site of The Haven Lakeside Residences. BWI Hotels Sdn Bhd group director of sales and marketing (Malaysia) Jonathan Badman says this will be the group’s first undertaking of luxury residential eco-resort in Malaysia and the first of its kind in South-East Asia. He says the Arizona-based company will further improve the design and facilities at The Haven to Best Western’s premier level, the equivalent of a four-star and above in hotel rating. The company manages and operates two hotels under franchise agreements in Malaysia currently, these being Best Western Kinabalu Daya Hotel in Kota Kinabalu and Best Western Marina Island Resort in Pangkor. Both are its core three-star brand. In the second quarter of this year, it will be opening in three new locations namely Best Western Sandakan Hotel and Residence in Sabah (170 rooms), Best Western Premier Dua Sentral KL (352 rooms) and Riverside Malacca (170 rooms). The group will be having four new locations in 2012 and 2013 in Malacca, Kuala Lumpur, Shah Alam, and The Haven in Tambun, Perak. “If we cannot bring value into a relationship, we will not do it. In the case of The Haven, it will be a win-win situation,” Badman says. The Best Western brand began operations in Malaysia in 2005 and Asia will be its growth market. The group manages and operates 165 properties in Asia and the Middle East. It operates in 80 countries and territories globally. KUALA LUMPUR: SP Setia Bhd, which has established a strong foothold in Johor, continues to expand its landbank in the state by acquiring a land from Kenyalang Property Development Sdn Bhd for RM125.8 mil. In a filing to Bursa Malaysia yesterday, SP Setia said its subsidiary, Setia Indah Sdn Bhd, had entered into an agreement with Kenyalang for the acquisition, which is expected to conclude during the financial year ending Oct 31, 2011. It plans to develop a mixed residential development located in the Tebrau corridor. SUNWAY Real Estate Investment Trust (REIT), Malaysia's biggest property trust, expects to do better than the RM170 million net profit it forecast for the year. This is due to strong rental revision of 16 per cent for its entire portfolio in 2010, which has improved performance of the properties, Datuk Jeffrey Ng, the chief executive officer of Sunway REIT Management Sdn Bhd said. Sunway REIT has eight assets worth RM3.7 billion. They are Sunway Pyramid Shopping Mall, Sunway Carnival Shopping Mall, SunCity Ipoh Hypermarket, Sunway Resort Hotel and Spa, Pyramid Tower Hotel, Sunway Hotel Seberang Jaya and two office tower. 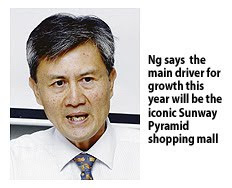 Ng said the main driver for growth this year will be Sunway Pyramid. Net rental for Sunway Pyramid was raised from RM8.90 per sq ft (psf) to RM9.40 psf after Sunway REIT's initial public offering last July, by Sunway City Bhd (SunCity). The mall has recorded a sales growth rate of 15 per cent, higher than industry growth of between five and 10 per cent. Any major change to the mall's earnings will have a positive impact on the trust's overall performance as it contributes 60 per cent to the trust's earnings. Ng expects Sunway REIT to also surpass its forecast revenue of RM330 million, led by overall improvement of Sunway Integrated Resort City (SIRC). SIRC, a multi-billion development by Suncity has two operating hotels, shopping malls and universities, Sunway Medical Centre, condominiums and villas, convention centres, shopoffices and a theme park. Ng said SIRC will benefit from the rising growth in tourism spending, which is around RM50 billion a year. "If SIRC continues to grow and be vibrant, there is no reason why Sunway REIT cannot achieve double digit growth year on year," Ng said. MELATI Ehsan Holdings Bhd’s wholly-owned unit Bayu Melati Sdn Bhd has sealed a joint venture agreement with PKNS Holdings Sdn Bhd to develop three parcels of land in Kelana Jaya, Selangor, into a mixed commercial development worth RM1.62 billion. The proposed development will feature serviced apartments, office towers, Soho offices, a sports complex, mall, hotel and a performing arts centre. SP SETIA Bhd’s wholly-owned unit Setia Indah Sdn Bhd has entered into a conditional sale and purchase agreement with Kenyalang Property Development Sdn Bhd to buy 106ha in Johor Baru, Johor, for RM125.8 million. It told Bursa Malaysia yesterday that it intends to develop a mixed residential development project on the land. Parkway Holdings Ltd, the Singapore hospital operator, said it will lease and operate a RM200 million (US$65 million) private hospital that will be built in Kota Kinabalu, Sabah. Parkway, controlled by Malaysia’s Khazanah Nasional Bhd, signed an agreement with Jesselton Wellness Sdn Bhd, a special-purpose vehicle set up to develop the hospital that is part-owned by an investment arm of Sabah’s state government, the company said in a statement. Danajamin Nasional Bhd, a Malaysian state bond insurer, will guarantee RM200 million of notes that will be issued to finance the project, it said.